Last week, I attended STORM magazine’s Keep It Going conference that discussed, debated and divined how sustainability in Singapore might unfurl and be harnessed. (I am a frequent contributor to the quarterly literary journal captained by rock star veteran journalist Kannan Chandran.) Covering the “Feeding The Hunger Of The Masses” panel, I was struck by these words from chef/restaurant design consultant/World Gourmet Summit mastermind/thought provocateur Peter Knipp: “Singapore is a food nation… but do you know the history of your food? And who’s behind it?” I do, but I wanted to know more. Basing this little project on a recent list by CNN Travel on “40 Singapore Foods We Can’t Live Without,” I decided to satiate some curiosity pangs. To say my mother is Hainanese and a gifted cook is like saying Singaporeans love to eat. Growing up in Hougang’s Hainanese kampong (village) community on my great-grandmother’s chicken rice (fowl fattened for the grand sacrifice, rice steamed in its fat, its glistening skin the outlying ingredient of the chilli sauce), very few renditions pass my mom’s taste test. Chicken rice is succulent chicken infused with ginger, then either poached or slung into a furnace and roasted. Expertly sliced with a flourish that’s Shaolin monk to the sushi master’s Samurai precision, the beautifully splayed meat is served atop rice first fried in chicken fat before being steamed in the poultry’s juices, pandan and ginger to fragrant heaven. Which means a visitor from China’s Hainan island would absolutely not recognize one of his or her native dishes. There, a skinny fowl is accompanied by oily rice and ground green chilli, and a pork stock is used in the preparation. When chicken rice arrived from Hainan, fresh off the junk boat in the colonial 1850s, the Cantonese (oh, those mighty master chefs of Chinese cuisine!) introduced kalamansi into the chilli sauce. They also turned it red, effectively giving chicken rice its Singaporean citizenship with the immigration of these local Southeast Asian ingredients into the recipe. 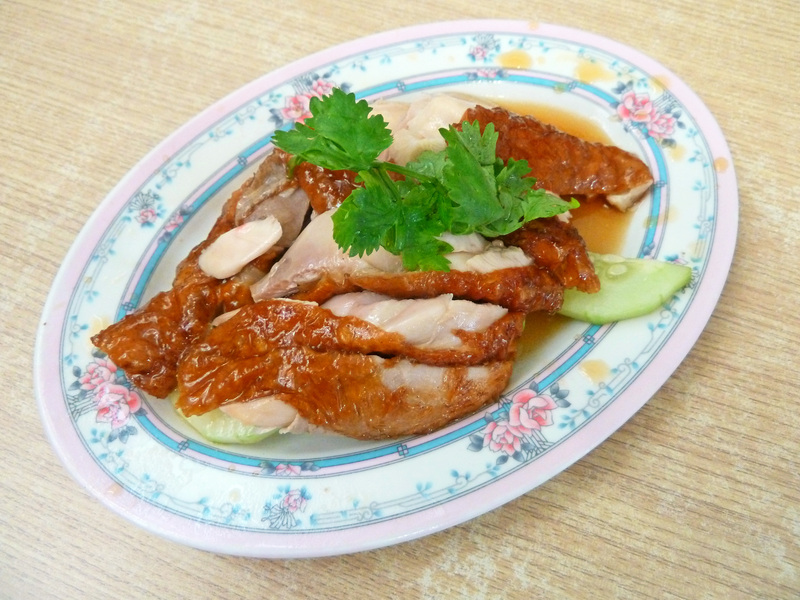 The dish took on a more curvaceous shape with tender young chickens, and started growing in popularity from the downtown Hainanese enclaves of Middle Road, Purvis Street and Sea Street in the early 1900s. Street peddlers shaped the rice by hand into softball-shaped balls before wrapping them in banana leaves for quicker and more seamless transactions. At stalwarts such as Yet Con, Chin Chin and Yeo Keng Nam, dark soy sauce and an elixir of freshly ground ginger and garlic complete the condiment tray; Hainanese purists drizzle the dark soy sauce over their perfectly round mound of rice, and mix the ginger/garlic dip into the chilli. Like most Singaporean dishes, the spice makes or breaks its case for epicurean euphoria – weak sauce can render a chicken rice non-existent. Make your request for breast, wing or drumstick portions, topping off with add-ons of gizzard, liver and intestines (best to go with a group, so you can pick every damned part clean). There are lots of big name chicken rice stalls, such as the Bour(roll eyes)dain-worshipped Tian Tian, Wee Nam Kee and Boon Tong Kee, but for chicken rice with soul, Delicious Boneless Chicken Rice at Katong Shopping Centre (865 Mountbatten Road), Five Star Hainanese Chicken Rice (191 East Coast Road) and Yeo Keng Nam (8 Braddell Road) are where you’ll find my mom digging into her favorite thigh-and-gizzard combo. 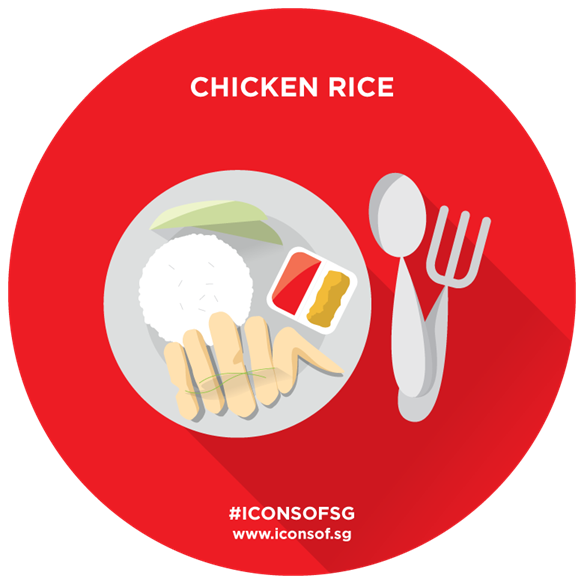 Chicken rice is one of our commemorative SG50 icons. This entry was posted in Food, Singapore and tagged chicken rice, five star hainanese chicken rice, hainanese cuisine, Singapore, singapore hawker heritage, singapore street food, yeo keng nam by Desiree. Bookmark the permalink.